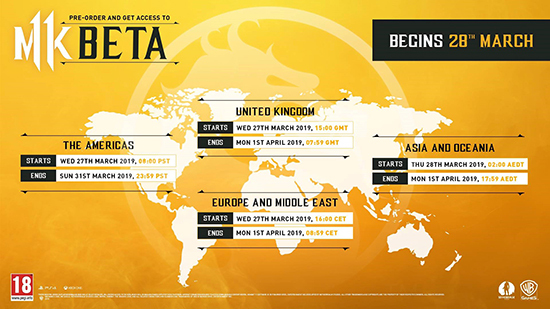 The Mortal Kombat 11 closed beta begins next week on Wednesday, 27th March at 15:00 GMT in the UK and will run through Monday, 1st April at 07:59 a.m. GMT. All players who pre-order Mortal Kombat 11 on PlayStation 4, PlayStation 4 Pro, Xbox One or Xbox One X at select retailers will receive access to the closed beta, which features five different characters, each with unique abilities and Fatalities, including fan-favourite fighters Baraka, Jade, Kabal, Scarlet and Scorpion. Mortal Kombat 11 is the latest instalment in the critically-acclaimed franchise, developed by award-winning NetherRealm Studios, and will be available beginning 23rd April for PlayStation® 4, PlayStation 4 Pro, Xbox One, Xbox One X, Nintendo Switch and PC. Pre-order now to receive the in-game playable character, Shao Kahn.